A flexagon is typically made by folding a strip of polygons, where each polygon is connected by edges to two neighboring polygons. These edges serve as hinges as you flex the folded strip, uncovering hidden faces. A different variety of flexagon relies on point hinges instead of edge hinges. These point-hinged flexagons, or point flexagons, have similar behavior to their cousin, the edge flexagon, but offer interesting exploration. 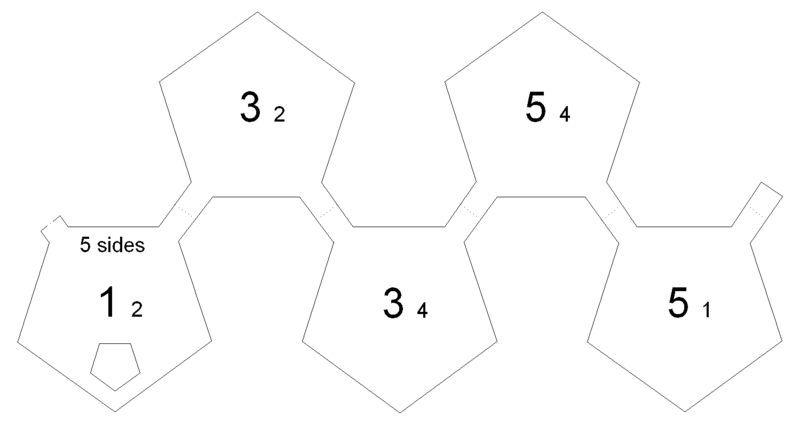 A good place to start is with a 5-faced point flexagon made from pentagons because it flexes fairly well and has non-trivial behavior. Click on the following net (pattern) to get a larger version, then print it out and cut around the edges. Pre-flex the hinges. 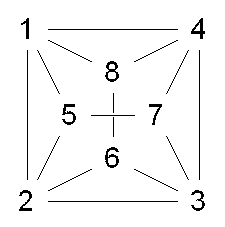 The taller number is used for the front face of a pentagon. Copy the smaller number on to the back side. Now fold the pentagons labeled 5 on top of each other. Then fold 4 on 4, 3 on 3 and finally 2 on 2. You should end up with a stack of polygons with 1’s on the outside. There will be two extra hinges sticking out that should be taped together. If you lift up the first leaf (polygon) in the stack, you’ll see a pair of 2’s. Lifting the bottom leaf will reveal a pair of 5’s. You can reach into other portions of the stack but you’ll find the other faces have hinges that prohibit you from folding the stack without bending the faces. If you continue to flex the top leaf across the two hinges that connect it to other portions of the stack, you should be able to fold it across a full 360 degrees so that the 2’s are now on the top and bottom of the stack. From here you’ll find that you can reach faces 1 and 3 but the others are inaccessible. The overall behavior is summarized in the state diagram above. A point flexagon is a stack of polygons. The faces can be numbered such that the top and bottom faces always have matching numbers, even as you continue to flex it. “Flexing” the point flexagon involves reaching into the stack and folding one portion of the stack across the pair of adjacent vertices that serve as the hinge so that you have a stack again, where you’ll find a new pair of faces has been revealed. As a result of the internal structure of some point flexagons, you may find that some faces can’t be directly accessed from a given face because there’s more than just a pair of adjacent vertices to that face. Like the edge flexagon, this can require you to go through intermediate flexes to reach them. The simplest point flexagon is made from two polygons, with each connected to the other on two adjacent vertices. You can then flex it across the pair of vertices to see the other side. If the polygons were connected by non-adjacent hinges, the flex wouldn’t be allowed because it would require bending the polygons to carry out the flex. Things are a little more interesting if you start from three triangles where each triangle is connected by a point to each of the other two. When folded, you’ll start with a stack that has 1’s on the top and bottom of the stack. Both of the other two sides are accessible from here. Depending on where you reach in the stack, you may flex it to find 2’s on the top and bottom or 3’s. You’ll find that any face is accessible from any other face. 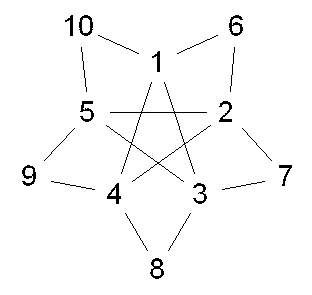 A more involved example, to demonstrate some of the variety you can see, is to look at the state diagram of one of the 8-sided point flexagons made from squares. 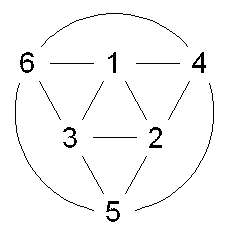 In the diagram, each number represents the state where the two faces with that number are on the top and bottom of the flexagon. The lines connecting the numbers represent the permitted flexings. So for example, starting from face 1, you can reach 2, 3, 7 or 8. But starting from 8, you can only reach 1 or 5. Before offering more patterns you can use to make various point flexagons, a few words on how to fold them. It can be a bit tricky to make a good workable model of a point flexagon since the hinge can’t actually be a mathematical point. The hinge has to have some width to it. One possibility is to connect the polygons with something such as string. But I actually prefer to use a thin strip of paper as the hinge because this makes the flexagon a bit more stable and it allows you to use a single strip of paper. The problem is that the hinge needs to bend two different ways depending on which adjacent vertex it’s paired with. This can be especially difficult for a polygon with sharp angles such as a triangle. I find the hinge works better if I push it in to invert it and add a couple more creases before flexing. To make the following flexagons, print out the pattern then cut around the edges. 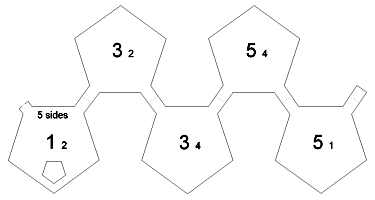 Each polygon has two numbers on it. The taller number is for the front of the polygon and the shorter number should be copied onto the back of the polygon. 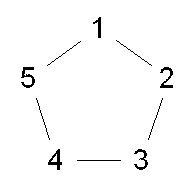 Start by folding together the highest pair of numbers, which should be found on adjacent polygon faces. Continue by folding together the next highest pair of numbers on down until you have a single stack of polygons with 1’s on the outside of the stack. Finish by taping together the two extra hinges. Note that these hinges may not necessarily be on the top or bottom face. Here are a couple nets for the 3-faced triangle and a 6-faced triangle. After a flex, you may need to make sure the hinges are aligned properly before continuing to the next flex. 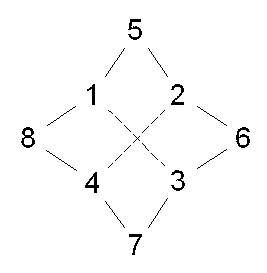 Note how the state diagram for the 6-faced variant differs from the corresponding hexahexaflexagon. Here’s a net for a 4-faced square. If you were to try to create an 8-faced square point flexagon by following the same pattern as the 6-faced triangle (above) and 10-faced pentagon (below), you’d come across a different type of flexing. Between faces 1 and 3, it flexes across a single pair of nested hinges rather than two adjacent hinges. But since the hinges are nested, this still only allows for a single option in folding. In the following diagram, this single vertex hinge is represented by a dashed line. Interestingly, a different numbering of the above net will yield a point flexagon with no single vertex hinges. 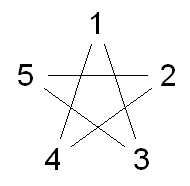 All its hinges are formed from adjacent pairs of vertices. And here’s a net for a different 8-faced square point flexagon. The state diagrams for both those last two point flexagons are a bit misleading in how symmetric they are. When you actually try them out, you’ll see that the way you access the hidden faces differs from face to face. Here’s an alternate way to make a 5-faced pentagon and a 10-faced pentagon variation.